Far-right parties seem to be knocking at the doors of every national parliament in western Europe, urging reflection on the reasons for the rise and success of these parties. A growing literature has explained this phenomenon as a form of “radical revolt”, an “insurgency” that challenges the established political parties. It is claimed that these parties flourish by exploiting the fear and anxiety of people disillusioned by the incapacity of the 'systemic' parties to respond to their insecurities, specifically in relation to economic and social phenomena like the economic crisis, criminality, immigration and so on. Does this perspective bear close scrutiny? If we take the case of the UK, immigration, according to Prime Minister David Cameron, is one of the issues which “created the space for extremist parties to flourish, as they could tell people that mainstream politicians weren't listening to their concerns or doing anything about them.” Cameron’s government has made this issue one of the key themes of its policies and propaganda, but surely that in itself is enough to make the narrative of the “radical revolt” which the extreme right is supposed to be waging against the “established political parties” wobble. In what sense is it a revolt, if they share a political agenda? The answer might be that far-right parties are extreme and ideological in their solutions (e.g. racist, in the case of immigration) whereas the established political parties claim that certain measures are necessary not for ideological reasons, but in response to objective concerns and the objective state of anxiety of the electorate. This answer, however, seems to reproduce and allow Cameron’s narrative rather than question it. Instead, let us ask, ‘what does this narrative allow’? First, it identifies and emphasises similarities between ‘extremes’, such as the claim that far-left and far-right share a common euroscepticism, thereby always eluding an analysis of the ‘moderate middle’ mainstream parties. Second, it works to conceal two further elements. 'Anxiety' is not a collective and individual psychological condition produced by the unfortunate contingencies of uncertain times. Rather, it has been a diffuse political feature and practice of neoliberal politics for many years now. Nor is the opposition between the so-called ‘established’ mainstream and ‘insurgent’ far-right parties a zero-sum game; on the contrary, this 'opposition' is co-productive of the political agenda from which ‘mainstream’ neoliberal parties benefit. A case in point was the approval, in 1992, of an Italian emergency law which sent over 5,000 soldiers to Sicily to fight the Mafia. In the course of the Parliamentary debate on converting the original emergency decree into law, this dynamic between the ‘moderate’ centre and the ‘extreme’ right became very apparent. Although the neo-fascist party, the Movimento Sociale Italiano (MSI), accused the government of collusion with the Mafia, it nevertheless supported the decisions of the majority regarding the exceptional measures and indeed reinforced the governmental parties’ definition of the mafia as a subversive force by arguing for the need “to respond to acts of war with acts of war”. It also claimed that the ‘mainstream’ parties were too soft. The MSI invoked additional measures such as transferring military power to local prefects and adopting the death penalty for mafiosi. This enabled the ‘moderate’ parties to claim that not only was this decree-law absolutely necessary to fight ‘the war’ against the mafia, but also that if the ‘democratic’ forces did not appear strong enough to react effectively to these threats, then autocratic and extreme solutions such as those proposed by the far-right would find their way through. Consequently, the exceptional measure was posed as both the response to an objective and technical need to fight the mafia and an urgent matter of confronting rising extremism. Through this combined narrative, ‘far-left’ opposition to the measures based on the argument that “the mafia is inside the institutions of the State” were branded as irresponsible and factionalist, and therefore disqualified from being a ‘proper’ political discourse. Although mainstream neoliberal parties reject ‘far-right’ solutions, they identify the same threats. In this way, neoliberalism can claim to act as a ‘responsible’ and ‘rational’ mediator between the need to tackle a threat and the autocratic solutions proposed by far-right parties. Paradoxically, this ‘middle way’ is manifested, as in the Italian example, by making the case for exceptional measures which simultaneously tackle the emergency but also impede anti-democratic solutions (!). The irony here is obvious, but it is interesting to ask what is reproduced by this co-constitution when anxiety becomes the driver of political decisions. It works by creating an essential link between the politics of the exception understood as an ‘objective’ necessity and the politics of anxiety in which it is entangled. First, this co-constitution enables the call for the exception to be shifted from an authoritarian agenda labelled as too extreme and too threatening, by adopting instead an economic and managerial language that ‘purifies’ the exception of its own excess. In the Italian case, the excessively autocratic rhetoric of the neo-fascist party was purified and made compatible with notions of liberal democracy based instead on an ‘objectivity’ inspired by the market values of technical efficiency. At the same time, the politics of anxiety works to reproduce the constant possibility of a return to the dramatic conditions which led to the necessity of the exception. Anxiety asks us to exercise ceaseless vigilance, both against the risk of the (eternal) return of the threat and because a lack of response to the threat could fuel extreme solutions. As George Osborne told the BBC, the Conservatives had to listen to the "anger and anxiety" of those who voted for UKIP in Thursday's local and European elections. Thus, anxiety ensures that the emergency is always in the process of re-emerging, or better, it erodes the thin line between what is (anxious) normality and the exception. Through the politics of anxiety, the normalisation of emergency becomes a de-politicised long-term necessity. 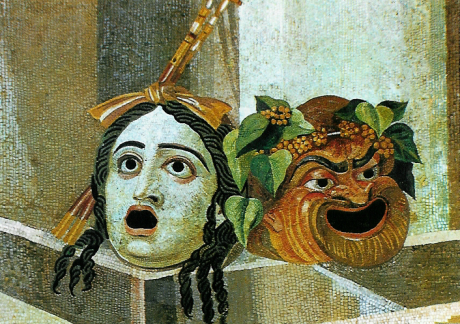 Theatrical masks of Tragedy and Comedy from the Capitoline Museum in Rome. Wikimedia Commons/Public domain. So, in the case of Italy, for instance, it was possible to extend the emergency law authorising the use of the Army in space, time and domain. In space, by gradually expanding its scope beyond Sicily to other regions in the South of Italy; in time, by extending the duration of missions from a few months to several years - in fact the military mission in Sicily ended only in 1998; in terms of domains, by using the Army to tackle not only organised crime but also illegal immigration. Anxiety becomes a collective and individual psychological condition due to the unfortunate circumstances of our times, and once it acquires this meaning, anxiety helps check and ban dissent. Dissent then, can no longer be expressed, because dissenting becomes a sign of being unreasonable and factionalist rather than objective, moderate and ‘technical’. This is clearly reflected in the practice of the last three Italian governments which, have in common different variations of the same motto, that of being the “governments of the doers”. Particularly interesting as regards Matteo Renzi’s current government is the centrality of the psychological aspect; according to Renzi, the aim of his government is to give back ‘hope’ to the citizens as a cure for their anxiety, and he has defined the positive results of his party at the last European elections as “the vote of hope”. In this context, those who disagree are automatically branded as opposed to necessary changes because they are unreasonable, factionalist and ideological. And being ‘ideological’ in times of anxiety, so the narrative goes, is counterproductive, because it does not deal with the fear of the always possible return of the threat(s) and it fuels dangerous extremism. To conclude, the initial question about the rise of extreme right-wing parties requires a very different answer to the one given by those who see the extreme right ‘filling the voids’ left by the mainstream parties. On the contrary, neo-liberal politics are intimately linked with the rise of far-right movements because they mutually constitute the political agenda and profit from it. Moreover, this different perspective enables us to see the significant conclusion we are meant to draw from the ‘rise of the far-right’, which is, the narrative tells us, that being objective, moderate and ‘technical’ rather than factionalist is what is needed in ‘times of anxiety’. Consequently, the politics of anxiety have a powerful impact and not just in terms of the party system. In actual fact, everything remains the same, since, as a recent study has shown, the extreme right parties have not so far managed to visibly alter the system. If anything, they make the system even more cohesive: the moderate and reasonable parties ‘have to’ unite in order to tackle the anxiety and marginalise extremism. Consequently ‘grand’ coalitions between moderate right and left parties flourish, as in the cases of Italy and Germany. Yet, what the politics of anxiety profoundly changes is the meaning of participating in the political arena, the conditions of access, or, the conditions under which one can be considered ‘reasonable enough’ to take part in the political process. The question which remains is, what is left of politics if this operation succeeds?